Mt. Vernon, OH - "The Kokosing Gap Trail Board of Trustees recognized its 30th anniversary at a recent dinner at The Alcove Restaurant, with three of the founding members in attendance. OB: No further info was provided. If you have more details regarding this closure, please contact us and we will update accordingly. Here's a follow up report on the accident and the cyclist's recovery. From mountvernonnews.com, "The Ohio Department of Transportation informed the city this week that funding has been approved for the project to route the bicycle trail under the Main Street viaduct, Safety-Service Director Joel Daniels reported Friday. "...The money will become available in fiscal year 2018, which begins July 1, 2017." From mountvernonnews.com, "City Council gave its approval Monday for the administration to apply for Ohio Department of Transportation alternative funding to design and build a bike path under the southernmost arch of the viaduct on South Main Street. "...City Engineer Brian Ball explained the need to purchase the land between the railroad bed where the main bike path is located and the river, through which the path leading to the viaduct will be built." "The only thing left to completely unite the Heart of Ohio Trail and the Kokosing Gap Trail is the trail loop under the Viaduct on Newark Road." From mountvernonnews.com, "Safety measures for pedestrians and bicyclists are part of the recent projects for the Heart of Ohio Trail in Mount Vernon. Employees with the Ohio Central Railroad were installing a large control panel near the trail's railroad crossing just south of the CA&C Depot this morning... two red flashing towers which are to go up following the installation of the control panel." The trail work in Mt. Vernon includes an already completed downtown connector for cyclists. The final phase is to connect with the Kokosing Gap Trail along the dikeway, just east of Main Street. Worth Noting: The Kokosing Gap is a part of the cross-state Ohio-to-Erie Trail. Much of the trail is tree-lined with the Kokosing River weaving its way alongside. There are a number of river crossings on perhaps 4 or 5 wooden-decked steel bridges, two of which are fairly long and provide great views. One of the longer spans has a built-in observation deck where you can stop and enjoy the scenery without blocking the trail. Posts mark the distance you've traveled every half mile. A number of the original concrete markers that were used by the railroad still remain and benches are stationed along the bikeway every half mile or so. Street name signs have been erected at most road crossings and even post the mileage you've covered when riding from Mt. Vernon. The trail provides some interesting scenery as it passes briefly along the edge of a college campus in Gambier. Lights have been installed here at the depot-like trailhead across from a wonderful display of an old steam engine, coal car, flatbed and caboose alongside the trail. The cars have been restored and painted and serve as a fine monument to this rail-trail's past. Trail users become more scarce as you head toward Danville and the scenery changes to farmland, some hills, woods and pastures. The trail ends without fanfare at a roadside trailhead in Danville. Turn right and ride a couple of blocks into town (follow the bike route signs) and you'll find a local park where you can take a break before your return ride. Or, head over to the nearby Mohican Valley Trail to explore another trail along this corridor. As you may know, the Kokosing Gap, Heart of Ohio Trail, Mohican Valley Trail and the Holmes County Trail are all part of the same former rail corridor. These 4 trail segments are also part of the larger Ohio-to-Erie Trail, a cross-state bike trail. Trail improvements in 2012 included bridge deck replacement, grading along the trail shoulders and center bollard replacement along the entire bikeway. The rigid bollards were replaced with a flexible, fold-over design. 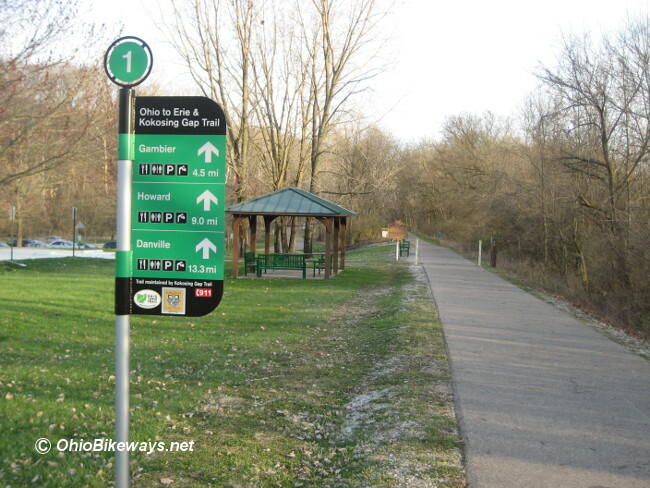 The Kokosing is one of several Ohio trails that has received improvements intended to avoid the rigid trail bollard hazard. At Mt. Vernon Avenue in Mt. Vernon, there is a split in the trail. The section that continues along the old rail corridor moves straight across the road and ends at Phillips Park. By heading west across the bridge at Mt. Vernon Avenue, you continue on the main trail along the river toward Main Street (Rt. 13), near downtown. The trail passes Memorial Park as it continues on to Main Street to connect with downtown and the Heart of Ohio Trail out of Centerburg, OH. An underpass is in-the-works to eliminate the road crossing here. The Kokosing Gap is open 24 hours a day. 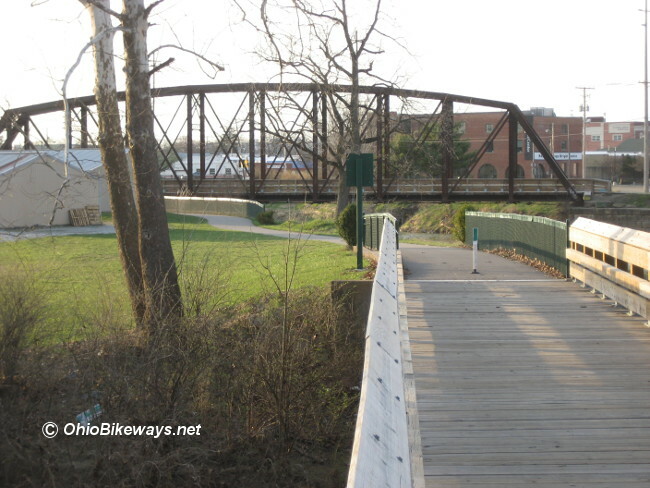 It is among the best maintained bikeways in Ohio. It never fails to provide an enjoyable trail riding experience. And that's no accident. This bikeway is maintained entirely by volunteers that do a terrific job.